Leading Transformation introduces an innovative yet proven process for creating breakthrough change. Divided into three steps – envisioning the possible, breaking down resistance, and prototyping the future – this process uses cutting-edge tools to overcome people’s inability to imagine or react to what doesn’t yet exist, and override powerful habits and routines that prevent them from changing. Successful business leaders recognize that change is the primary driving force in strategic planning. Keeping pace with technology, competition and the regulatory framework within which you operate demands a constant reinvention and transformation of your organization. 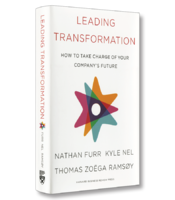 In their new book, Leading Transformation: How to Take Charge of Your Company’s Future, authors Nathan Furr, Kyle Nel and Thomas Zoëga Ramsøy identify the biggest obstacles to such transformations as human nature. Fear, political infighting and an intractable commitment to established habits will undermine even the most detailed strategic plan. The authors collaborate to present a radical new method to transcend these stereotypical responses to change. Nel is the executive who designed and implemented the model, Zoëga Ramsøy is the neuroscientist who helped make it work, and Furr is the academic who explains why it works and how to do it. After struggling for years in second place to archrival The Home Depot, Lowe’s, the North American hardware retailer, sought a new approach to transformational change. Their first step, with the assistance of the authors, was to embrace a dramatic new approach to strategy. Using science fiction writers instead of business executives, they developed a new strategic narrative of how Lowe’s could position itself to solve critical customer problems by using technology. The writers were provided with research data on consumer needs and technology trends and then asked to imagine a new vision of Lowe’s 5 to 10 years in the future. No other restrictions were given. This one decision broke the traditional mold of how a strategic plan is developed and challenged the common obstacles of incrementalism and intractable habits that typically limit creative thinking. Six years later, Lowe’s is developing exosuits –– external robotic skeletons –– to help workers carry heavy items, and is using robots to greet customers and take inventory after the stores close. Understand the organizational nomenclature so that you can present the narrative in terms they will understand. Simply speaking their language will help to establish credibility in the face of the unknown. Create decision maps of both the formal and informal decision-making structure inside the organization. Acknowledge the organizational chart, but also establish the identity of the real decision-makers. Identify the functional archetypes so that you can incorporate what motivates those key decision- makers into action. The authors identify fear of the unknown as one of the strongest obstacles to transformational change. The emphasis on risk and uncertainty stifles the willingness to embrace change while also limiting creativity in visualizing future potential. By harnessing the perceived accuracy of data through future key performance indicators (FKPIs), the authors found that the fear of the unknown could be dramatically reduced. Their work with IKEA in Europe demonstrated the potential of removing obstacles to future change. Tracking customer focus groups using a range of experimental design tools led the company to a home solar product that enabled customers to generate their own renewable power. Leading Transformation presents a fascinating new approach to overcoming traditional obstacles to transformational change. Detailed examples from a wide range of companies, including Lowe’s, Walmart, IKEA and Google offer data-rich evidence for a process that will enable your organization to transcend the stereotypical resistance to change.